1.PLANTING – NOW IS A GOOD TIME TO PLANT TREES, SHRUBS AND PERENNIALS. OUR FALL SALE CONTINUES - 30%OFF TREES AND SHRUBS, 25% ON PERENNIALS. 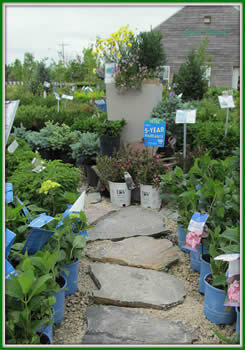 FREE DELIVERY OVER $60.00 WORTH OF TREES AND SHRUBS. .2.USE A TRANSPLANTER OR MYKE, WHICH IS A ROOT STIMULATOR TO GET THE PLANT SETTLED IN QUICKLY. IF YOU PURCHASE MIKE WHEN YOU BUY A TREE OR SHRUB FROM US, WE CAN OFFER YOU A 5 YEAR GUARANTEE!!! YOU CAN’T BEAT THAT! 3. GET RID OF PROBLEMS NOW! 4. ANTS – FEED ON THE HONEYDEW EXCRETED BY APHIDS. GET RID OF ANTS AND YOU GET RID OF APHIDS. 5. FUNGUS – IF YOU HAVE HAD PROBLEMS WITH FUNGUS, WORK IN SULPHUR DUST INTO THE SOIL TO PREVENT FUNGUS IN THAT SPOT NEXT YEAR. 6. LAWN – FALL FERTILIZING IS DONE NOW & REMOVE THE WEEDS. DON’T LET THE WEEDS GO TO SEED). 7. FERTILIZING – STOP – LET ROSES PRODUCE ROSEHIPS AND TREES AND SHRUBS GET READY FOR WINTER. PUT DOWN FERTILIZER SPIKES IN LATE OCTOBER ( 3 SPIKES FOR EVERY 2” OF TRUNK AT CHEST HEIGHT). WHEN SPRING ARRIVES, THE FERTILIZER SPIKES WILL BREAK DOWN EARLY WITH THE HEAT AND MOISTURE AND GIVE YOUR TREE AN EARLY BOOST! 8. TAKE IN PLANTS & TAKE CUTTINGS (BEFORE TEMP. DROPS TO 10 OR LOWER). USE CINNAMON FOR A ROOTING HORMONE. 9. TOMATOES – CUT THE TOPS TO ALLOW ALL THE STRENGTH TO GO INTO RIPENING THE FRUIT ON THE PLANT. FREEZE THE TOMATOES WHOLE IF YOU HAVE AN ABUNDANCE. TO RIPEN TOMATOES, STORE WITH APPLES AS APPLES GIVE OFF AN ETHYLENE GAS THAT WILL CAUSE THE TOMATOE TO RIPEN QUICKLY. USE CARROTS TO SWEETEN TOMATO SAUCE INSTEAD OF SUGAR. TOMATOES (ETHYLENE GAS), IT WILL CAUSE THEM TO SPROUT. 11. AMEND YOUR SOIL. PEAT MOSS, MUSHROOM MANURE OR AGED SHEEP OR COW MANURE IS EXCELLENT TO USE IN OUR CLAY SOIL. FOLLOW THE ABOVE ADVICE AND YOU WILL BE ALREADY FOR SPRING!!! CHECK OUT OUR PLANT SEARCH ENGINE!